Ukraine’s president held a debate with an empty podium after his opponent didn’t show up. 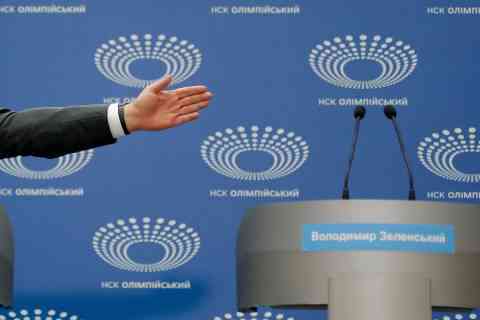 Presidential election challenger Volodymyr Zelenskiy refused to attend the set-piece event in the capital of Kiev, leaving current president Petro Poroshenko gesturing towards a vacant lectern bearing his rival’s name. It happened despite Mr Zelenskiy being the one who suggested the debate in the Olimpiskiy Stadium. However, he wanted it to be on Friday, where Mr Poroshenko demanded it on Sunday. Mr Zelenskiy refused to accept this. It left Mr Poroshenko to make a statement and take journalists’ questions as a crowd of thousands watched outside the stadium. One week before the election, however, Mr Zelenskiy is holding a commanding lead in the polls. He is a comedian who has never held elected office. But Mr Zelenskiy has argued his lack of political experience is an advantage because he has no ties to corruption in Ukrainian politics.